Walt's Disney's Kim Possible Season 1 is a Disney Exclusive DVD. It is Brand New & Factory sealed. This DVD is RARE and very hard to find. It is Disney Exclusive and is not available in stores!!! 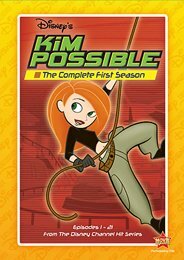 Here's the sitch: Disney Channel's hit animated series KIM POSSIBLE SEASON 1 is finally here on three discs containing 21 awesome adventures -- that's over seven hours of fist-flying, action-packed, SO not your average episodes. If there's danger or trouble, she's there on the double to save the world from villains like Professor Dementor, Drakken and Señor Senior Junior AND make it home in time for cheerleading practice. Luckily, she has her sidekick Ron Stoppable and his pet naked mole rat Rufus by her side. So don't miss all the thrills, chills and homeroom study skills in the family favorite, KIM POSSIBLE SEASON 1.